We have been on a Valentine's Day kick here lately and our light table has been constantly covered in hearts. I couldn't help it...I found so many cool Valentine's things at the dollar store that were just perfect for some light table play. For instance, I found this awesome sheer, heart-covered gift wrap at the dollar store. It is almost like sheer fabric. I just knew it would look fabulous on the light table and, of course, I was right. 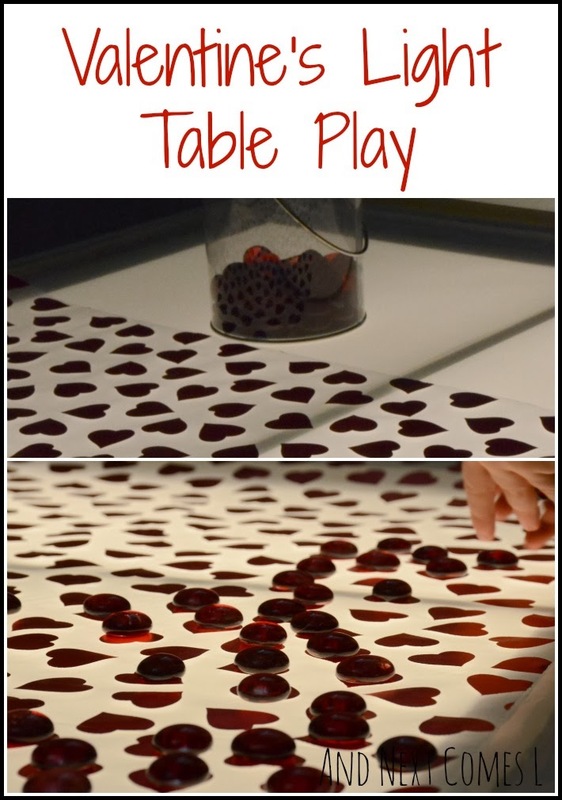 This Valentine's Day light table activity for kids looks fantastic! I placed the heart gift wrap on top of the light table. You could tape it into place if you'd like, but I didn't bother since K, the little destroyer, wasn't awake to move it around and I knew J wouldn't really move it around. I then set out some red glass stones. J started placing a red glass stone on each heart, counting along as he worked. As you can see, this activity is great for reinforcing one-to-one-correspondence. It looks beautiful, doesn't it? I love this! Using the gift wrap is awesome! Looks so fun!